Hop aboard the Freight Train and experience Donald Crews award-winning ride like you never have before. This fully interactive app helps children learn to read by taking them on an exciting trip along the rails. Colors, numbers, and words are introduced to young readers through all of the lively sights and sounds of the railroad. Youll really be working on the railroad as you watch Donald Crews Caldecott Honor illustrations come to life at the touch of your childs hands. This truly interactive App makes it easy to read along with the story and sing along with familiar songs. 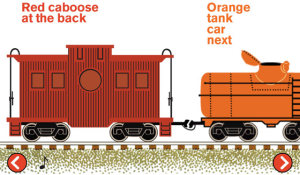 Your child will be able to interact with all the cars on the Freight Train as it goes down the track. Move over Thomas the Tank Engine theres a new train in town. Curious Puppy Apps deliver a fun and educational experience for toddlers and preschoolers. All of our apps are designed to help children learn to read and to be played and enjoyed again and again. Curious Puppy Apps are developed by HarperColins Childrens Books, home to many of the classics of childrens literature, including Goodnight Moon, Where the Wild Things Are, The Giving Tree, Charlottes Web, the Ramona books, and countless other award-winning and New York Times best-selling titles. Are you irritated with the character limit enforced by the cell phone carriers as 160?